This entry was posted on 25th March 2019 by Life Changing Challenges. Normally we all get up, chat, bit of banter and off we go. Not tonight, there was a ripple of nervousness around camp as we stepped into the mess tent for a meal of spaghetti. 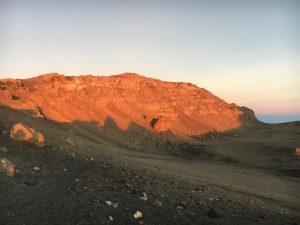 It was hard to get down, the familiar feelings of unease and queasiness could be seen on the faces of many and I had the makings of a headache – my first symptom since stepping on the mountain. We tried to eat but I think we all knew it was futile and even worse, we knew we hadn’t been able to get enough in. We would have to rely on the snacks we had brought. Stepping out of the tent we collected the refilled water bottles – gave the day sacks a final check, switched on the head torches and set off…poley poley. There was a marked difference to the guides as we gathered, they appeared a lot nervier and serious. We were to be accompanied by some of the porters which was also a nice change for us. We had bonded really well with the excellent group who were there to take care of us and it would be a nice touch to summit with them. 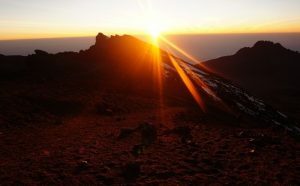 Bruce pulled me to one side, advised me that he had planned to take around 7 or 8 up to the summit to help and that if need be would split us into groups to ensure that we could hit the summit successfully and before sunrise at around 06h30. I nodded along, he was in charge but just wanted to run his decisions past me and therefore, the group. We gathered in our now familiar single file, head torches lighting up only the person in front and set off up the track. We set off at around 23h30 with the aim to reach Stella point at or around 06h30 the next morning, it was bitterly cold but not as cold as I had first thought. As we moved off the guides advised that we would have natural rest stops every hour and that we should avoid unnecessary stops on the route. It was a trudge, we couldn’t see anything at all as we stared down at our feet, one foot in front of the other on and on for what seemed an eternity until we reached our first stop. Reaching for the water we all started to realise it was freezing in the bottles and the camelback hoses were starting to block with ice. I grabbed some food – a nondescript bar of something that highlighted on the wrapper HIGH ENERGY BOOST. It tasted of nothing and had the consistency of rubber, not sure if it provided a high energy boost or I needed one to digest it? I took the time to check on Kertrina who had again been suffering from sickness before we set off. She wasn’t in a great state and was complaining of dizziness, it was at this point that I noticed we were now down to 11 as one of the group had found the going a little tough and was behind us with some of the other porters and one of the guides. We set off again, this was getting harder and harder, we were climbing from 4,600m to 5,745m and I was reaching for every breath – trying to take in as much oxygen as I could. We passed the next rest point, and the next…we could all now see that Kertrina was struggling to place her feet at the front of the line and just as I shouted out to one of the guides – she fell. From where I was, it looked like her feet just stopped working and her legs buckled underneath her. I rushed to the front of the line and checked her over, talking to the guide that she couldn’t go on but we managed to get some food in and gainfully set off again. After only a short distance she went again and this time I tried to insist that she was done, in fact she was saying it herself so the guides conceded and the group set off with another guide at the front whilst Kertrina sat and rested, she was trying to be sick whilst the guides passed her food. 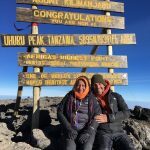 I was torn between staying and going on, the guides convinced me that she was OK and Bruce advised me to keep going – I looked at Kertrina, gave her a little kiss and reluctantly moved on. The worry had woken me up and it didn’t take long to catch the rest of the group up but before long we were all back in our zombie state. The cold was biting, exhaustion had set in and at the next rest stop I sat next to one of our group and for a brief moment, fell asleep leaning on her back! This was not a good situation, I could barely keep my eyes open and all we could see were head torches bobbing around ahead of us and all the way back down the mountain. I kept looking back to see if I could see Kertrina but in the darkness, shapes were indistinguishable. By now I was fighting to stay awake when all I wanted to do was curl up and go to sleep. One of our porters, Ambrose could see my struggles and every time I sat down started to massage my shoulders. As he dug his hands in sharp pangs of pain went up and down my back, I shot up and carried on…when I sat to rest again I saw him coming towards me so forced myself up again to get away – it might have been a little unorthodox but it worked. Normally throughout the preceding few days I felt incredibly close to the rest of the group but with Kertrina missing and with complete and utter exhaustion I felt isolated. I had no idea of the time, distance or elevation and the ground resembled talcum powder. Dragging myself up with the poles I couldn’t even differentiate between the head torches and stars. Then I saw what looked like a VW camper van…now I was going mad too! Step, step, step…on it went. One of the group was in front of me and from the bottom of his pack hung a small bag on a piece of string. Being much taller than me this bag was just a bit lower than head height but the way it swung when we walked was hypnotic and it nearly had me swaying so much that I thought I was going to go over. I gave him a bit of space which helped focus my mind and for a moment I thought I could see the dark outline of the summit just up ahead. I could hear faint cheers; we must be near the summit! Dawn was fast approaching now and we could see the faint outline of light coming away to our right. Push, push , push lets go was rattling around in my head and using the poles to help pull me up we all dragged ourselves to Stella Point and collapsed to our knees – utterly exhausted and incredibly emotional I looked around to see the sun peeking up in the distance. We had made it! Congratulations all around, I went to shake the hand of one of the team – he gave me a big bear hug and it was at that point I realised that everyone suffered the same as me. One of the young girls in the group was standing next to me smiling, she had struggled earlier in the week but had pulled herself around remarkably to get to the top – I congratulated her and gave her a hug where she proceeded to burst into tears. Thoughts turned to Kertrina, I rushed to Bruce to try and get some news. 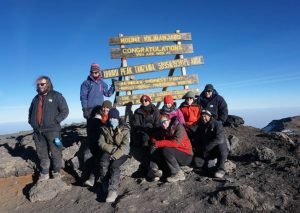 He told me that she had headed back down the mountain, I was disappointed for her but grateful she was ok. After some pictures Bruce then told us we had to move onto the summit proper – Uhuru. This was a little over 100m in elevation from where we were and would take another hour as we had to walk around the crater. Gathering ourselves we set off, head torches now stowed away we shuffled around the crater and as we turned, hit a very shallow hill – that was it, we had had enough of climbing and everyone found themselves a nice spot and sat down. I’m not sure if we were expecting someone to bring the peak to us but that little act of rebellion for around 10 minutes helped us get back together as a group and before long we were off again. We saw the now famous sign post in the distance and wandered over to it. There was a group finishing their turn at posing for pictures and it gave us the opportunity to crash out on the nearest rock and try and catch our breath. We had the obligatory photoshoot and Bruce advised us it was probably best to start heading back to Barafu camp, with a more of a spring in our step we headed back towards Stella Point in order to start heading down – one of the guides was walking slowly towards us, he had someone in tow who I simply didn’t recognise. Being told that Kertrina had headed down the mountain I had simply assumed that he came up with someone else until I realised that the tired lady next to him was in fact my wife! I couldn’t help but give her a huge hug, the guides were keen that she have her photo opportunity so we let the rest of the group go whilst Kertrina, the guide and I posed for our own set of photographs. She explained that the guides and porters simply wouldn’t let her give up and almost dragged her to the summit where she reached the top barely an hour after us. She looked utterly exhausted though and as soon as the as the pictures were done, the guides advised that we had better get her down the mountain quickly. We made good time to Stella Point and then looking down we saw the scree that had given us so much trouble coming up…going down would be fun!